We have this really wonderful Thai restaurant in downtown. They make some fantastic steamed wontons with this delicious dipping sauce. I always make sure that I order them when we go. I really wanted to try and replicate a healthier version of them that I could enjoy on a regular basis. A few weeks ago, I was given an amazing opportunity to get some free organic mushrooms from a local grower. I couldn't think of anything better to do with the beautiful mushrooms than making one of my favorite kinds of pizza - sausage and mushroom! This is one of those recipes that you're going to want to make anytime someone comes over and will have it on repeat for the rest of the summer! It's super easy to make and packed with flavor. The best part of this recipe is that you can leave it to marinade overnight or prepare it just 30 minutes in advance! This week has been boiling hot in Maine. I know that many of you aren't from Maine and are going to think that I'm a big baby, but mid 90's with high humidity is HOT here. I'm not used to this kind of temperature! You see, all of you thinking, "It's in the 100's here regularly and we deal with it!" I recognize that I'm being a baby, but we have no air conditioning. Zip. Zero. Zilch. That means my house easily reaches well into the 100's while I'm trying to cook lunches and dinner. We have been trying to stay cool and capitalize on the fact that we only live a few minutes from the beach and have a wonderful pool in our backyard. 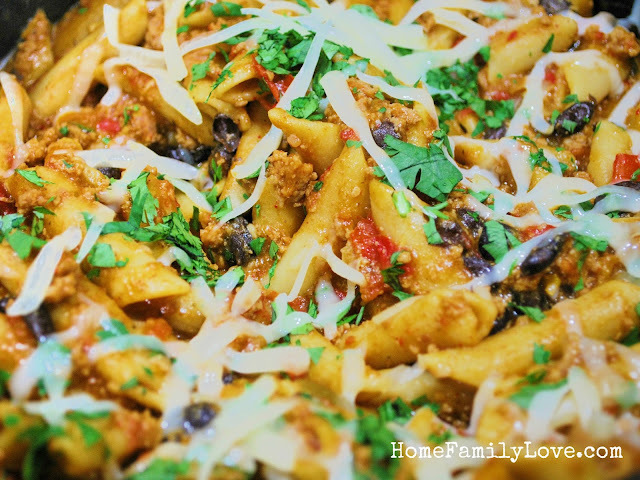 It hasn't been easy though and most of our meals have consisted of BBQ or something super quick and easy. It hasn't been good for my healthy lifestyle choices. I've had so many burgers, grilled chicken, and pasta salad that I was craving something filling that reminded me of the cooler weather. I couldn't bare the idea of making enchiladas in the oven (I mean, can you blame me?! It was already 98 when I last looked!) 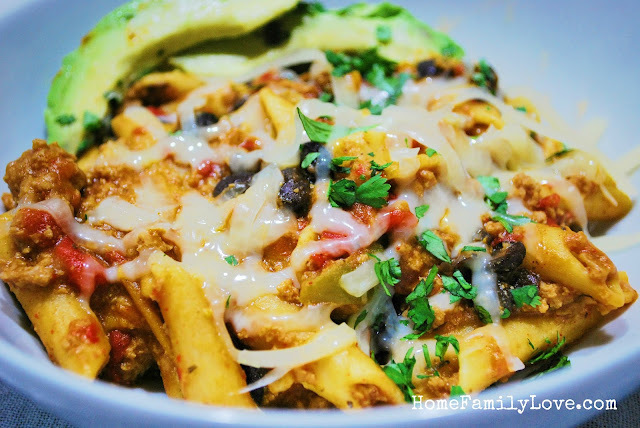 and decided on making this delicious one-pot beef and black bean enchilada pasta. I love summer! It is my absolute favorite time of year. It's my chance to spend time with my kids and really just enjoy being a mom. We try to go on a bunch of different adventures and really just focus on being a family. Sometimes, in the chaos of the school year, it can be difficult to have those moments of quality time and we have to really focus on ensuring we fit those moments in. This summer I have taken a break from work and everything else to just focus on spending time with my kids and family. It has been a wonderful summer, but I'm missing my blog and all of you. I'm ready to be back and focusing on my weight loss. What are some of your favorite activities for this summer? I know that it's been a really, REALLY, long time since I last posted. Life got a little too chaotic at work and home and I lost focus. Taking care of myself and creating my blog took a backseat to all of the stress and work that needed to be completed. I'm truly sorry for this. I have taken a few days after the end of my school year to refocus and reprioritize. I am determined to get back on track and share some pretty fantastic recipes with you. This is the perfect quick, 30-minute, meal for the entire family. My littlest one is our pickiest eater and I often have to fight him to get him to eat anything remotely healthy. This meal was a huge hit with him! He might have been covered with sauce and cheese by the end, but it was completely worth it to know that he had eaten a well-balanced and nutritious dinner.